TL; DR: As companies grow and require a secure, international online presence, Interoute touts hosting solutions to meet the needs of modern business. Security, scalability, and a high level of customization are integrated into Interoute’s platform, which has been recognized as one of the best in the world. Leveraging flexible, cloud-based IT services helps companies focus on running their core operations while Interoute’s worldwide network ensures they’ll have the computing infrastructure they need to serve ever-expanding markets. The advent of mobile computing and social networks dramatically changed the face of modern business. Consumers increasingly use their favorite mobile device for a wide variety of purposes — most notably eCommerce and streaming rich media content. Watching all of those videos and shopping on all of those websites, however, can expose a network’s flaws. The burden of providing consumers with a fast, secure, and always available network falls on the companies serving them. And, as with real estate, location matters in hosting. Investing in a worldwide computing infrastructure carries significant risk for many businesses, making global cloud services and network provider Interoute attractive to many organizations. Letting IT experts manage the network allows firms to concentrate on serving their customers. Interoute’s infrastructure solutions are known for their security and reach — especially in the European market. Speed, scalability, and flexibility are their hallmarks. Companies looking for the network horsepower to expand their global footprint benefit from Interoute’s range of offerings. With their genesis as a networking company focused on the European market, Interoute leveraged fiber-optic cable to build the fastest network on the continent. Originally formed in 2002 to serve business and governmental customers in the European Union, the company’s first major task involved connecting large business hubs in Europe. This expansion led to interconnected datacenters in the United States, Hong Kong, and Singapore, along with select locations in Africa and the Arabian Peninsula. With Interoute’s secure, global infrastructure, data is always in proximity to where consumers need it most. Now comprising a network of more than 250 datacenters, Interoute offers their customers a wide range of cloud-based services. This extensive range gives clients the necessary computing infrastructure to truly serve a global audience. The Virtual Data Center (VDC) is Interoute’s original cloud service offering. Positioned as an Infrastructure-as-a-Service (IaaS) product, the VDC offers customers a scalable and flexible solution with a secure private network. This flexibility allows businesses to quickly build a hybrid network containing their on-premise infrastructure and public cloud resources in addition to services hosted on the Interoute VDC. Leveraging state-of-the-art automation features, the VDC can optimize network performance — leading to lower latencies, lower costs, and higher throughputs. A global footprint puts applications and their data closer to end-users. Meanwhile, Interoute boasts compliance with local data residency regulations from all around the world. They offer a variety of service levels for managing their clients’ VDC instances: fully self-service, partially assisted, and completely managed. Companies can choose a level compatible with their needs, factoring in whether they have an in-house IT team. For businesses with a development staff, Interoute allows for the management of a VDC within a customer’s applications. Businesses can add a variety of apps to a VDC to help customize the platform to their needs. This flexible service model includes a library of applications customers can quickly add to their VDC infrastructure. They run the gamut — from operating systems, storage options, and databases to a broad range of business software. In short, Interoute offers adaptable hosting and cloud solutions to meet the needs of most businesses and governmental agencies. Interoute’s network security is based on the industry-standard MPLS (multiprotocol label switching). The protocol provides both high performance and low latencies at no loss to overall network security. All Interoute VDC offerings take advantage of this firm network backbone. Furthermore, the company adopts a multi-layered approach to handling the plethora of cyber-threats impacting most organizations with an online presence. Interoute security includes the mitigation of Denial-of-Service attacks, network intrusion prevention, and content filtering. They offer 2-factor authentication and managed firewalls to further enhance the security of their customers’ VDC infrastructures. Interoute gives businesses a variety of service options under their Digital Enterprise Platform (DEP) umbrella. Organizations can create on-demand network infrastructures boasting industry-leading security, latency, and throughput. Internet Cloud Connect functions as a cloud-service accelerator, creating faster data flow throughout a company’s cloud infrastructure, whether it resides on-prem or in a public cloud or comes from a private provider. The extension of Interoute’s MPLS over a wide area network (WAN) boosts both speed and security. Other valuable features include an on-site firewall or DMZ, optimized application routing, and access to VDC machines for computing power and storage. With a worldwide infrastructure, including this datacenter in Paris, Interoute is able to deliver speed. Interoute offers an array of Ethernet services delivered across their secure network as well, with 2Mb/s to 10Gb/s speeds and a variety of delivery options, including point-to-point and point-to-multi-point. A flexible pricing plan lets customers use only the throughput they need while a bursting option provides a measure of scalability for short-term increases in network traffic. Business Virtual Private Network (VPN) services are another part of Interoute’s Digital Enterprise Platform. All VPN customers benefit from Interoute’s VDC Cloud platform, including the full suite of aforementioned cloud-based applications. Interoute’s network engineers manage the entire VPN solution for their customers on a 24/7 basis, which is an essential advantage for any organization using cloud-based services. Finally, Interoute offers dedicated high-speed Internet access to their customer base. 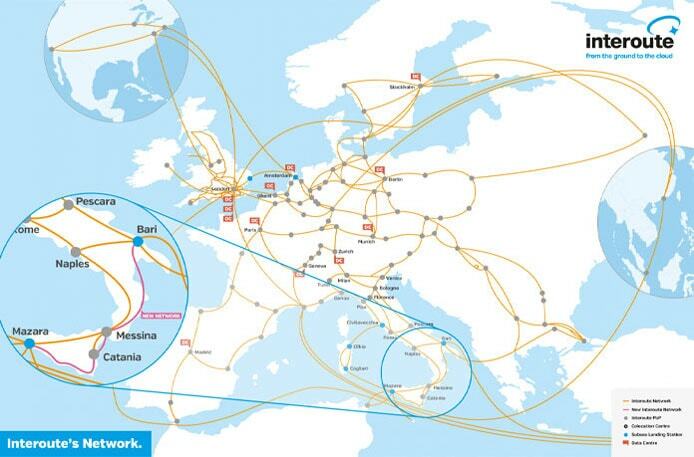 The company’s European network ensures superior performance considering the proximity to the Euro-based access providers also using Interoute’s network. These connections include some of the leading content delivery networks on the Internet such as Google, BBC, Microsoft, and others. Services are delivered using DSL, leased line, or Ethernet at speeds ranging from 2Mb/s to 10Gb/s. Routers are available with the service, or the customer can use their on-premise equipment. Internet access comes with the same 24/7 service as Interoute’s other DEP offerings. Distributed networking plays a significant role in providing global Internet users the necessary speed and bandwidth no matter their location. The end-consumer may not realize it, but the experience when browsing a store’s website or watching videos on a mobile device is greatly improved when the infrastructure delivering the data or content is closer to the viewer. Keeping datacenters in proximity to customers is a focal point to Interoute’s mission — giving them superiority over other cloud-service providers when it comes to network speed. A simple look at the report findings from the cloud analyst group Cloud Spectator reveals Interoute’s preeminent status. Cloud Spectator ranked the leading cloud providers on a variety of network benchmarks, including latency, throughput, and upload and download speeds. Interoute ranked first in the overall index in all eight tested cities — six in Europe and two in North America. Interoute is constantly expanding their global footprint with new datacenters, including this one in Madrid. The study’s conclusion recommended Interoute for any business with a large server presence in Europe and a customer presence in Europe or one of the company’s American VDC locations, New York City or Los Angeles. Keeping data close to those consuming it remains a significant influencer for end-users’ Internet experiences — whether they are working with a large NoSQL database instance or enjoying a 4K video stream. Internet users expect a secure, fast, and responsive online experience — requiring cloud service companies like Interoute to design, build, and operate distributed networks to serve businesses behind those online experiences. Additionally, Interoute’s full suite of complimentary services and applications make them worthy of exploration by any organization wanting to leverage cloud-based services to save costs and focus on their core business.